He's been boning up on his routine.. Used a ref for parts....and lots not. This makes me laugh. This is so cool i can't tell you how cool it is! Very nice! Is Mr Bone Jangles a popular character? Sorry, I've been living in a cave for a while. That's cute Dave. Well done too, nice drawing. This is completely and utterly awesome. The joke is so lame it makes me crack up! :-P hehe I am still laughing, but that is an awesome drawing you've got there. Haha...silly, but I love it! 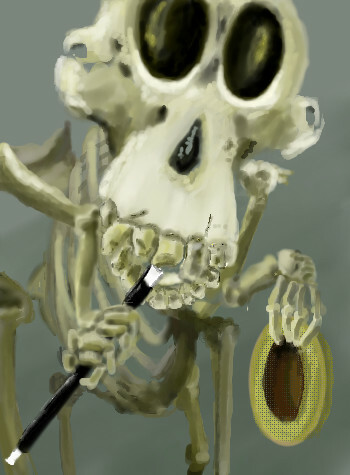 So you're 'boning' up on drawing skeletons...okay, eww. This made me laugh too! You should do more pun pics...goes with that fun personality of yours. Wow.. haha, that's Really cool. And pretty funny too. I'm not so sure about the texturing on the hat... It would probably look better if you textured it manually. But overall, I really like this one.